Tangled and True: eleven collection. As Lily was transitioning from toddler shoes to kids shoes, I found myself in search of the kind of shoes I had fallen in love with for her younger self. I wasn't finding much until I happened upon Eleven Collection. Sister company to my favorite toddler shoe See Kai Run, I was ecstatic to say the least. The styles are a bit more grown up but feature the same quality and impeccable style that I know and love. 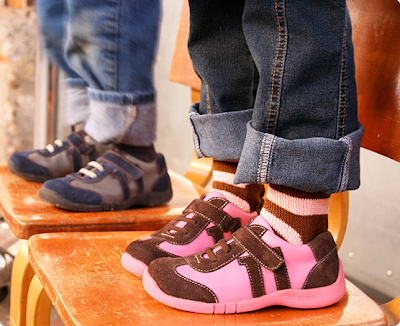 Our mission is to create wonderful shoes for little travelers who make each step an adventure. Based in the Northwest, Eleven combines quality footwear with independent style and modern accents. Eleven shoes feature soft leather uppers and flexible durable rubbers soles providing superior traction. The high quality leather is naturally water resistant and each style features easy on and off Velcro or zipper closures. Available in girls, boys, boots and sandals. I'm happy to say with Eleven we've crossed over into kid shoes without missing a step. Love the See Kai Runs so I'm sure I'll love these. I wasn't aware of their "big kid" line - thank you! The shoes was very cute... I read that this shoes was also made of high quality leather and are naturally water resistant.